THE DEVIL BEATING TIME --- Here's a 1964 art house revival of Beat The Devil in L.A. The film had lost money ten years before on initial release and star Humphrey Bogart was said to have regarded it a washout (he took a beating on personal funds invested). An early cult developed around Beat The Devil and sophisticates called it arch parody of thrillers the cast had done before. Patronage in the end might have preferred another thriller and to H with Devil's arch parody. Bogart could have used a straighter dose of gin by 1954 and gone-long separation from vehicles that had won his following. The Enforcer from 1951 seemed a last in that vein, and appropriately released by Warners. HB had been announced for The System in 1953, but chose to end the pact with WB, by mutual consent. Frank Lovejoy toplined The System instead. The picture was good with Lovejoy; with Bogart and one of his approved directors (Raoul Walsh? ), it might have been exceptional. Beat The Devil was a John Huston indulgence, the only one of their collaborations I find hard to watch. It needed studio polish, and who wants Bogart in an ascot sending up crime we'd rather see him knee deep in, or opposed to? 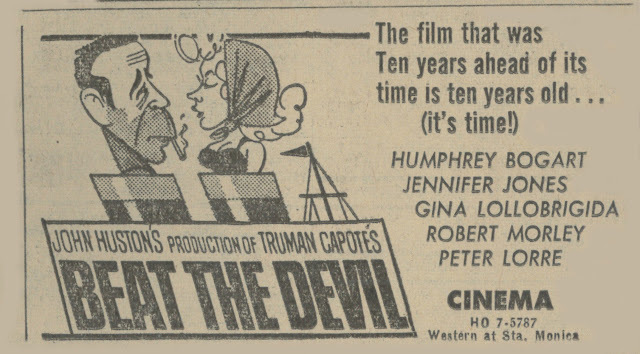 The 1964 ad at top was clear aimed for art consumption, what with possessory credits for John Huston and Truman Capote (and note misleading ad art above from 1954's initial release). Bogart had sold his interest in Beat The Devil to Columbia in February 1955. They possess original elements that look by far the best. 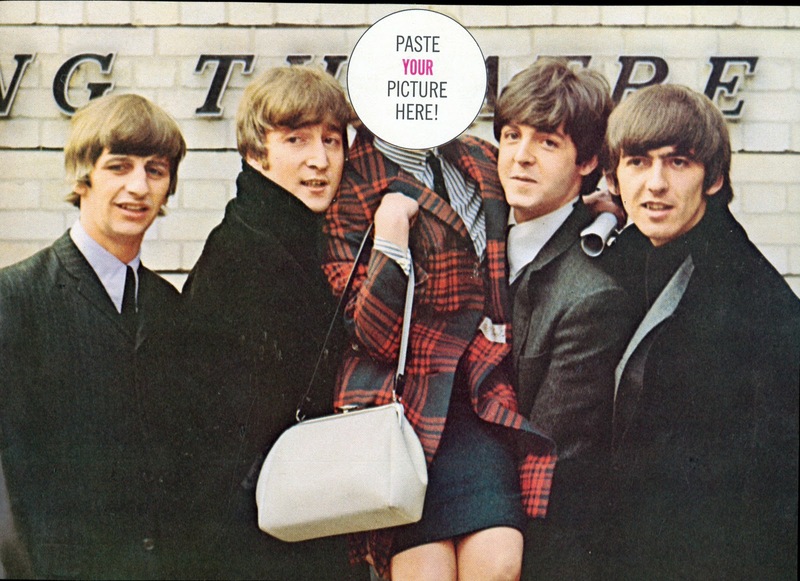 GO AHEAD: PASTE IT --- The above is suitable for framing, assuming Photoshop skills allow impose of your own foto among these Fab Four. My recall of the Beatles suggest that girls circa 1964 would have been comfortable lifted aloft by them. This quartet amounted to a safe date. Cheeky yes, threatening never. The fantasy pose was on page two of a teen fan mag the likes of which my '64 eyes scanned by on quest for monster covers, the two formats often side-by-side on newsstand shelves. In fact, I wonder if Sixteen or year-later Lloyd Thaxton's Tiger Beat didn't crowd out Horror Monsters or, heaven forbid, Castle Of Frankenstein on many racks. The cover of this Beatle dollop also promised an "intimate talk" with Peter and Gordon, along with insight as to what Jane Asher (Paul's GF at the time) was "really like" (I'd have said go see Masque Of The Red Death and find out). And which two of the Dave Clark Five were wed? Didn't matter so much as a same query put to the Beatles. I remember the first night the Mop Tops appeared on Ed Sullivan. Seems there was "Sorry Girls, He's Married" superimposed over a close-up of John Lennon at one point. Does anyone else recall this? 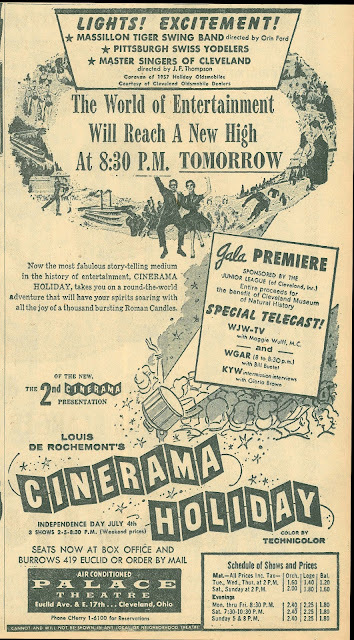 CLEVELAND'S CINERAMA HOLIDAY --- In a perfect world, Cinerama would still be running, like planetariums or the zoo. Will IMAX someday face similar extinction? Maybe I should pay more attention to IMAX while we still have access. The Born Too Late mantra certainly applies to this 1957 Cinerama date. I'll bet other three-year-olds taken at the time to this Cleveland premiere count Cinerama Holiday as their earliest vivid memory. Wouldn't you? The extravaganza appears to have begun outside, with television and two radio outlets live from the scene. Holiday was the Palace's second Cinerama show, the first having played years. You didn't have to be in New York or LA to sustain a run of Cinerama: that's how special it was. Assume there were Cleveland-ers who'd been to see This Is Cinerama a dozen times. I'd have made it a regular activity, but wait, look at these admissions. Seeing Cinerama wasn't cheap; sort of like 3D today but with greater novelty and entertainment value. And imagine the Caravan Of 1957 Holiday Oldsmobiles snaking down city blocks toward the Palace, with Pittsburgh Swiss Yodelers to accompany. Oh, for a glimpse of Cleveland that night! OLD-TIMERS REUNION OFF THE WIRE --- I met producer A.C. Lyles once and mentioned the westerns he'd done during the 60's for Paramount release. He acted ashamed of them, but need not have. They were plenty OK for program pix, supporting bigger Para product on combos still a habit for then-theatres, and stock has risen for the group thanks to increased interest in vet players making in some cases final stand before a camera. 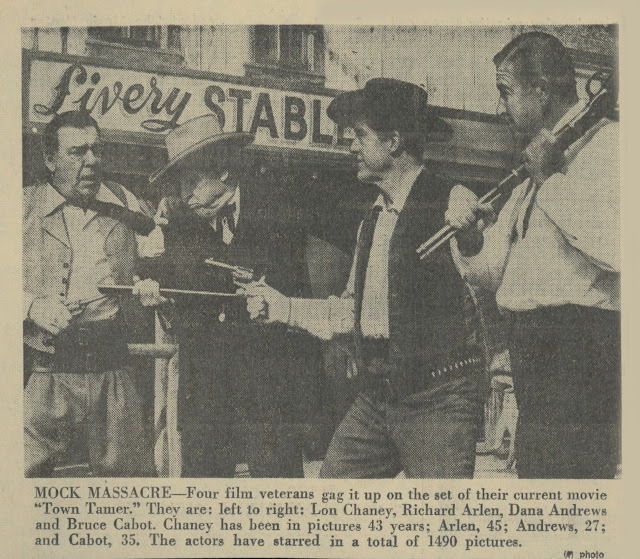 Lyles' were echoes of B westerns gone from the scene a decade by the time he began doing his in color/scope. Near as I can make it, there were thirteen of these. All are choked with folks who'd been in the business at least twenty years, some with marquee value yet in small towns where fans hadn't forgotten. I'd catch them at Liberty doubles, Waco with Rasputin, The Mad Monk for instance. Would be great to have the lot on DVD, but I think Paramount only released one that way. The "mock massacre" in this gag photo emphasizes the years these guys toted up as a group, and 1490 past-pix between them! Wonder what Paramount flak did that math, or maybe it was lifelong buff Lyles himself. OZONER ONSLAUGHT --- What a hook drive-ins threw out to suckers. This one's baited with promise of hot stuff with three sirens of the day: Marilyn Monroe, Jane Russell, and Rita Hayworth, none of which were seen to advantage in pix unspooled here. 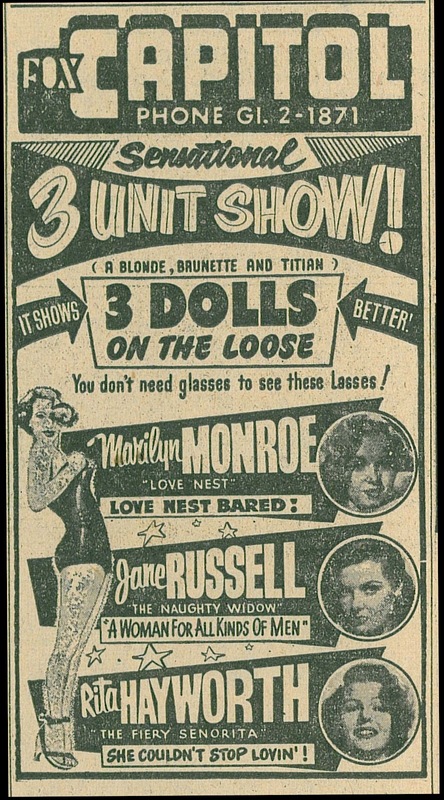 I like the slam at 3-D: You Don't Need Glasses To See These Lasses. Whoever dreamed that up should have ridden front in that year's Oldsmobile Parade. Also note A Blonde, Brunette, and Titian. Does anyone use the word "Titian" anymore in referring to redheads? Wouldn't there be risk of being, shall we say, misunderstood? Love Nest Bared! must surely have been misunderstood to regret of ticket-buyers, as the 1951 Fox feature was anything but delivery on the title's promise, though there was Marilyn Monroe briefly in swim attire. The Naughty Widow had been going by that misleading title for a while, being actually Young Widow and dating back to 1946. Haven't seen it, but doubt Jane Russell being "naughty" at any point, considering censor vigilance where her image was concerned. The Fiery Senorita must remain a mystery. Surely this wasn't a western Rita Hayworth did with Tex Ritter in the late 30's. In that event, She Couldn't Stop Lovin' would have translated to They Couldn't Stop Leavin', cars exiting the Fox Capitol Drive-In's parking lot, that is. Yes, I absolutely remember "Sorry Girls, he's married." I also remember thinking at that first viewing that I'd never get straight which Beatle was which. Hard to believe now. As for that photo of the movie veterans...Lyles or whoever "did the math" must have accepted the notion that Creighton Chaney made a childhood appearance in one of Dad's movies, 'cause his real movie career wouldn't add up to 8 years older than Bruce Cabot's. Nancy Drew was always "titian-haired Nancy Drew," at least in the old editions of the books. But yes, that word surely disappeared at some point and would inexplicable now. I love Beat the Devil. So many quotable lines: "Breathe deeply, Billy, every breath a guinea in the bank of health!" "O'Hara is a very old and distinguished Argentinean name... there are many Germans in Argentina who have come to be called O'Hara." To your point about it being an early cult movie, Peter Schickele of PDQ Bach fame talked on one of his radio shows of him and his Julliard classmates catching it whenever it turned up at a Greenwich Village art house in the early 60s; like so many cult movies, it seemed to offer the thrill of seeing mainstream Hollywood's mask fall and absurdity overtake the movie factory's assembly line. Yeah, I'm kinda with you (and Bogie), John. BEAT THE DEVIL has some good lines and great little bits but seems like a slog these days. Certainly years of really crappy P.D. dupes hasn't helped. As to the Imax/Cinerama comparison, Our local Omnimax just converted to a somewhat more conventional Utrascreen theater showing plain old movie-movies. Those sturdy A.C. Lyles cowboy rehashes were also a mainstay of my youth. If one was the second half of the grindhouse double feature, I had a much better chance of talking my Western-fan brother into joining me to check out the latest Hammer horror. I see STAGECOACH TO TABLE ROCK is streaming on Netflix. Last time I saw that one was on the big screen, paired with something like THE MAN WHO COULD CHEAT DEATH. 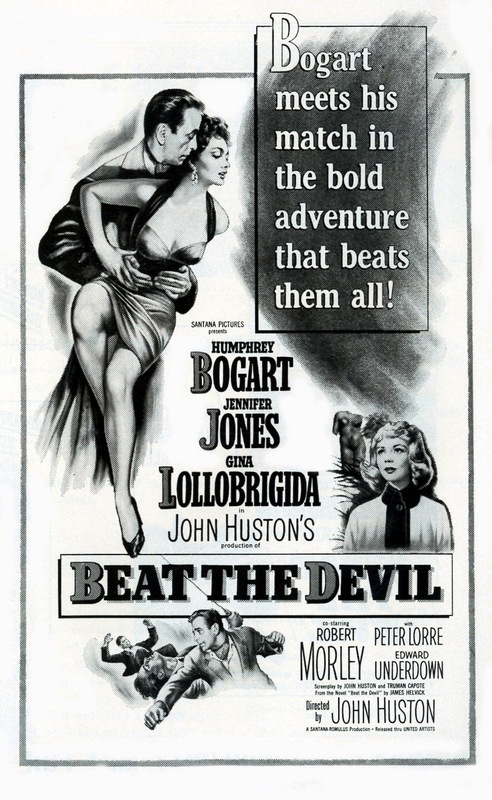 I'm one partial to the goofiness of "Beat the Devil". Although I'd seen it many years ago and enjoyed it, I didn't really "get" it until I saw some of the Ealing comedies of the late 40s and early 50s. "Beat the Devil" has a similar kind of vibe - that understated British humor that can be so serious about the most ridiculous things, like a hot Italian wife obsessed with British lawns. I read a journal article some years ago about the making of the film and it's easy to see why Bogart was so displeased with the whole affair, with Capote and Huston writing the script on the set and making it up as they went along. After the discipline and tight production of the atmosphere of Warner Brothers, I'm sure Bogie wondered what kind of crazy bunch he'd thrown his money at. I've got an original window card from the original release when it played in Asheboro, NC, with the Columbia PR touting it as a two-fisted Bogart adventure. They really were at a loss on how to sell this thing - I imagine it might have done decent business in the UK where the humor was similar to the BBC radio series "The Goon Show" that was getting started about that time. 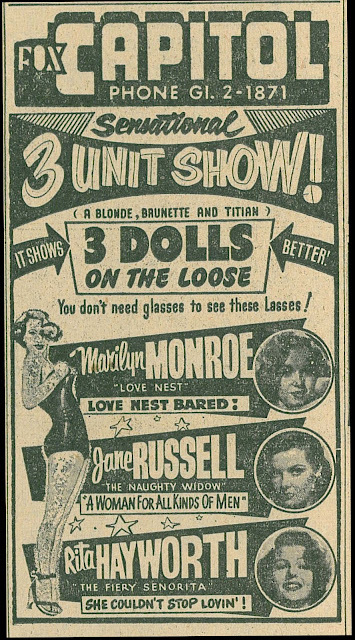 And on Marilyn Monroe - I've got another window card from a theater in Asheboro dating from the time when Monroe was a big draw in the 1950s, promoting a showing of "Ladies of the Chorus", a film where she appeared in her first lead part in 1948. A look at reissues of minor early Monroe efforts in the 50s might be an interesting little post - I'll bet this wasn't unusual when Monroe was such a hot property. Your memory serves you well. There was indeed a sub-title indicating Mr Lennon's marital status. I recently saw a clip on (PBS I Think.